The Economy line of hand trucks from Wesco Industrial Products, of Lansdale, Pa., offers users on a budget safe, easy transport of materials in a variety of configurations. All models (Economy Wide Plate, Super Economy and Super Economy Jr.) feature 10” x 3-1/2” pneumatic wheels for smooth rolling, and heavy duty single loop handles allow multiple positions for one-hand control. 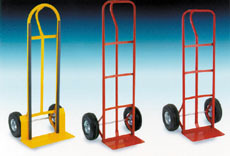 The Economy Wide Plate Hand Truck features wheel guards to provide a wider support base.